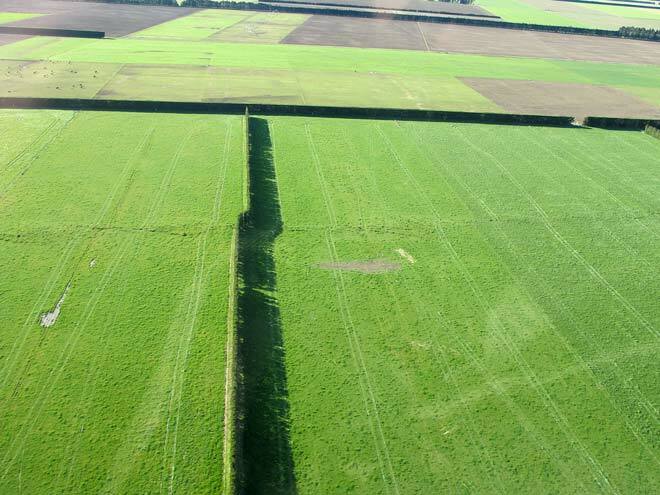 The rupture of the earth’s surface is clearly visible in this aerial shot of the Greendale Fault, around 7 kilometres west-north-west of Burnham township. This photograph was taken from a helicopter at an altitude of around 200 metres, looking north, about 12 hours after the Darfield earthquake. The hedgerow and tractor tyre tracks in the paddocks have been horizontally offset by about 3.5 metres. The land in the foreground has moved to the left (west), the land on the far side of the fault rupture has moved to the right (east).